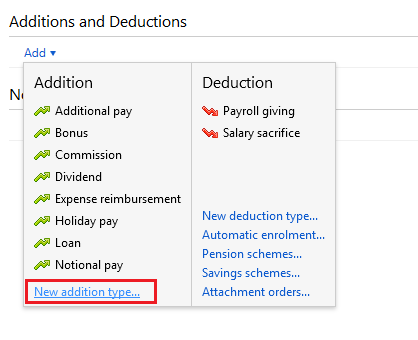 To enter an addition on the employee's payslip, click on the ‘Add’ button within the ‘Additions & Deductions’ section. If applicable, select a preset addition from the list and enter the desired amount. To add a further addition repeat this process. If you wish to add an addition which is not available in the preset list, simply choose ‘New Addition Type’. Set up your addition as required, choosing the criteria that is to apply. Should you wish to edit the additions you have set up, simply click the ‘Edit’ button. Here you will find a facility to set an addition to repeat every pay period until you choose to manually remove it or to repeat up to and including a particular pay period in the future. If you wish to re-order any additions you have set up, an ‘Ordering’ function is also available here. To enter a deduction on the employee's payslip, click on the ‘Add’ button within the ‘Additions & Deductions’ section. Select a preset option from the list or choose ‘New Deduction Type’ to set up a deduction of your own. 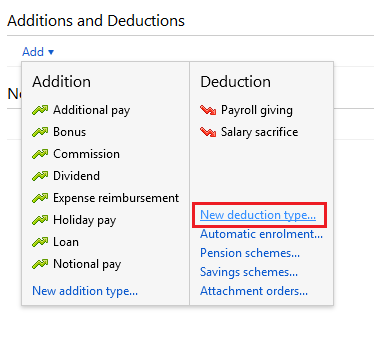 Should you wish to edit any deductions you have set up, click the ‘Edit’ button opposite the applicable deduction. Here you will find a facility to set a deduction to repeat every pay period until you choose to manually remove it or to repeat up to and including a particular pay period in the future. In addition, if you wish to re-order any deductions you have set up, simply use the ‘Ordering’ facility provided.